As the world's population increases and the demand for water increases apace there is a rising demand for information concerning the reuse of wastewater, particularly for the irrigation of key food crops worldwide. This important new book addresses in detail the use of treated wastewater in agricultural situations, its impact on crops and the soil environment. Coverage includes the composition and treatment of wastewater, health considerations, regulations and economic aspects. Major sections of the book also concentrate on crop management and the soil environment. This book is an essential purchase for all those working in irrigation, water management and crop production worldwide. Guy J. 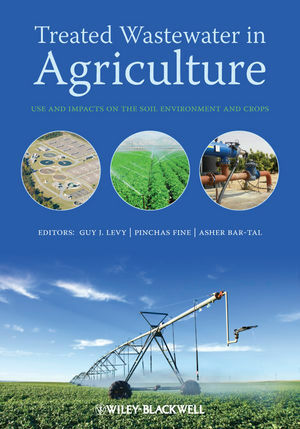 Levy, Pinchas Fine and Asher Bar-Tal are based at the Institute of Soil, Water and Environmental Sciences, Agricultural Research Organization, The Volcani Center, Israel. Chapter 1 Sources and composition of sewage effluent; treatment systems and methods (Renato Iannelli and David Giraldi). 1.1 Sources of usable wastewater. 1.2 Main characteristics of usable wastewater. 1.4 Framework for the selection of the optimal treatment train. Chapter 2 Health considerations in the recycling of water and use of treated wastewater in agriculture and other non-potable purposes (Hillel Shuval). 2.2 Rationale: why should society allow, regulate, and thus encourage exposure of the population to known health risks? 2.3 Persistence of pathogenic microorganisms in water, soil, and on crops from wastewater-irrigation. 2.4 Disease transmission by wastewater-irrigation. 2.5 Control of crops and irrigation methods to reduce health risks. 2.6 Development of health standards and guidelines for wastewater use. 3.2 Historical development of water recycling and reuse regulations. 3.3 Water recycling in agriculture: quality issues. 3.4 Treatment requirements and TWW quality monitoring. 3.5 Water reuse criteria: irrigation of agricultural crops and landscapes. Chapter 4 Economic aspects of irrigation with treated wastewater (Efrat Hadas and Yoav Kislev). 4.3 Wastewater and the regulation of its reuse. 4.7 Cost allocation and prices. 4.8 Further considerations and alternatives. 4.10 The role of the government. Part II IMPACTS ON THE SOIL ENVIRONMENT AND CROPS. 5.1 Nitrogen in treated wastewater-irrigation (Asher Bar-Tal). 5.3 Calcium and carbonate (Gil Eshel and Michael J. Singer). 6.1 Boron (Uri Yermiyahu, Alon Ben-Gal and Rami Keren). 6.2 Chlorides in treated wastewater and their effects on plants (Uzi Kafkafi). Chapter 7 Heavy metals in soils irrigated with wastewater (Amir Hass, Uri Mingelgrin and Pinchas Fine). 7.2 Heavy metals in effluents. 7.3 Organic matter: composition in wastewater effluents and behavior in soil. 7.4 Attenuation of heavy metals in soils irrigated with effluents. 7.5 Loading limits of metals. 7.6 Metals: interaction with soil components. 7.7 Distribution of metals among the soil’s solid fractions. 7.8 The stability, pH and Eh of free oxides, and their effect on the geochemical distribution of metals. 7.9 Heavy metal solubility and speciation in the soil solution. 7.10 Mobility of heavy metals in the soil profile. Chapter 8 Salinity (Nico E. Marcar, Tivi Theiveyanathan and Daryl P. Stevens). 8.1 The nature of salinity. 8.3 Mechanism of soil salinisation. 8.5 Effects of salinity on plant growth and water use. Chapter 9 Physical aspects (Guy J. Levy and Shmuel Assouline). 9.4 Soil surface sealing, infiltration and runoff. Chapter 10 Fouling in microirrigation systems applying treated wastewater effluents (Carlos G. Dosoretz, Jorge Tarchitzky, Ilan Katz, Elisha Kenig and Yona Chen). 10.2 Quality of treated effluents as a source of irrigation water. 10.3 Emitter clogging in relation to irrigation water quality. 10.4 Management of emitter clogging. 10.5 Recovery of clogged emitters. 10.6 Concluding remarks and future prospects. Chapter 11 Effects of treated municipal wastewater irrigation on soil microbiology (Dror Minz, Rachel Karyo and Zev Gerstl). 11.2 Soil microbial ecology and activities. Chapter 12 Impact of irrigation with treated wastewater on pesticides and other organic microcontaminants in soils (Zev Gerstl and Ellen R. Graber). 12.2 The effect of DOM on the chemical behavior of organic xenobiotics. Chapter 13 Organic matter in wastewater and treated wastewaterirrigated soils: properties and effects (Yona Chen, Carlos G. Dosoretz, Ilan Katz, Elizabeth Jueschke, Bernd Marschner and Jorge Tarchitzky). 13.2 Organic matter in wastewater. 13.3 Soil organic matter (SOM). 13.4 The influence of treated-wastewater-borne organic matter on soil organic matter. 13.5 The influence of treated-wastewater-borne organic matter on soil properties. Chapter 14 Analysis of transport of mixed Na/Ca salts in a three-dimensional heterogeneous variably saturated soil (David Russo). 14.2 Modeling of transport of mixed Na/Ca salts in spatially heterogeneous, variably saturated soils. 14.3 Simulation of transport of mixed Na/Ca salts in spatially heterogeneous, variably saturated soils. 14.4 Summary and concluding remarks.